On June 8, 1975, ten members of the North American Flyers club arrived at Katama Airport in Edgartown, on Martha’s Vineyard, to practice stunt flying. There were five aircraft among the group, all former military fighter planes converted for civilian use. 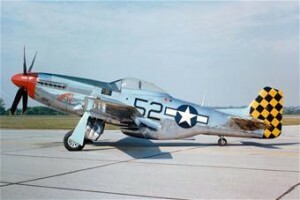 Shortly before 1:00 p.m., a 43-year-old pilot from Southbury, Connecticut, was making some low altitude aerobatic maneuvers over the airfield in a P-51D Mustang, (Military Serial #44-74008), (Civilian registration #N76AF). While the plane was at an altitude of about 1,000 feet it suddenly went into a spin and dove into the ground about twenty feet from the airport’s main administration building. There was no fire or explosion, but the pilot was killed instantly. One witness to the accident was Edgartown’s chief of police who was standing near the adminsitration building at the time. He later told reporters that he began to run when he saw the plane falling, and that the impact occurred about thirty feet away from where he’d been standing. Unknown Newspaper, “Stunt Pilot Killed On Vineyard”, June 9, 1975.